Crawfish fans no longer need to call around to restaurants and supermarkets to find the best size or cheapest price. Now, there’s an app for that. Created by Baton Rouge couple Ryan and Laney King, the Crawfish App launched in February and is already making it easier for the hungry crawfish buyer and sellers. The app offers a guide for customers to find live or boiled crawfish and browse by price, distance or review. The idea originated when the Kings were looking to host a crawfish boil but were finding it difficult to find price information from area vendors. Laney says she remembers her husband asking why someone hadn’t created an app for this. The two started brainstorming for the app right at their kitchen table. Laney says with her business background and Ryan’s engineering mind, they were able to come up with a basic flow chart. “Ryan could hone in on how it should work and what the different screens could look like,” she says. For the app’s design, the couple hired a graphic designer. As for the actual programming, they said it was difficult to find someone who could do exactly what they were thinking, but they ended up lucking out when Ryan’s cousin, who is an app consultant, was able to program the app for them. The app launched with 150 vendors the couple were able to compile through research and friends. But, within days, downloaders submitted more through the app’s “submit new vendor” feature. Today, Laney says the app has about 711 vendors with hundreds pending. The couple likes to verify each vendor’s existence and price before officially placing them on the app, which typically takes seven to 10 days. 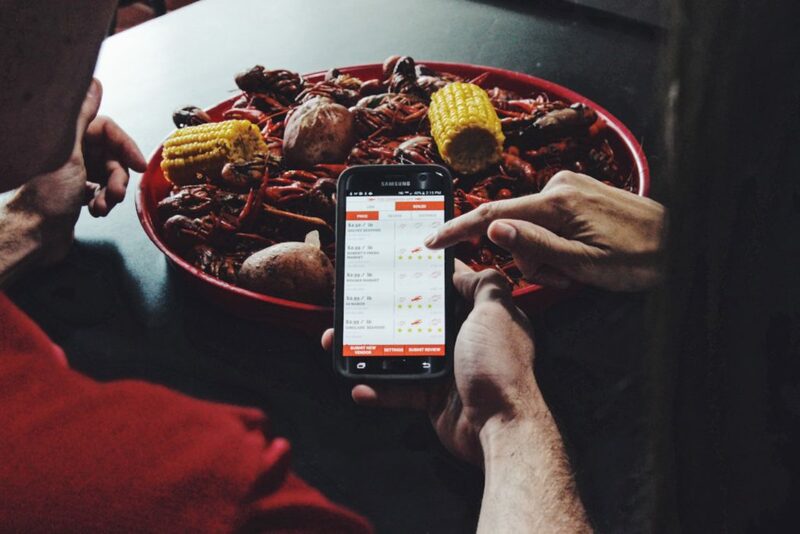 The Crawfish App initially started in five Louisiana markets: Baton Rouge, New Orleans/Covington/Mandeville, Houma, Thibodaux and Lafayette/Lake Charles. Now, they’ve expanded to 10 states, Ryan says, including Texas, Alabama and Florida. Right now, the Kings and a team update the crawfish prices on the app by calling every vendor on Thursday and updating on Friday. “We want people to have the most up-to-date prices for the weekend,” Laney says. However, to offer daily price updates, the app is in a testing phase of its “vendor portals,” which will allow the vendors to log on and update their own prices. Laney says they expect to see this feature become a reality in about two weeks. About two weeks ago, the app also launched its reviews feature, which allows users to rate the size of the crawfish they bought and leave one comment per vendor. Laney says they’ve seen about 300 comments already offering useful information to other shoppers. “We’re really hoping the reviews section allows users to see what the quality of crawfish are like,” Ryan says. Along with the “vendor portals,” the couple is exploring the possibility of advertising and even adding a banner to the top of the app where a vendor can buy the featured space. Ryan says they’d like to allow more space for vendors to provide more information about their crawfish and specials. “We’re going to be in a constant state of improving,” Ryan says. The Crawfish App is free to download for users and vendors on the Apple App Store and Google Play.